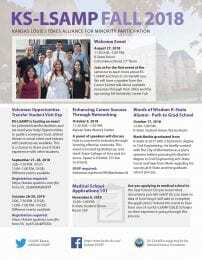 KS-LSAMP will have a table at the annual College of Arts & Sciences Research Opportunities Fair. Stop by to say Hi! and pick up some information for the coming semester. Join us during the first event of the semester to learn more about KS-LSAMP and how it can benefit you. We will talk about our events for the semester and you will have the opportunity to meet and interact with other students. Are you thinking of applying to scholarships this semester or in the future? If the answer is yes, then plan to attend our workshop. We will be discussing the different components of a scholarship application, mainly the personal statement and letters of recommendation. The workshop will get you thinking about how to best complete these components. KS-LSAMP has scholarships available to eligible students, information regarding these scholarships will be discussed at the event. Interested in sharing your STEM/K-State experience with others? KS-LSAMP is hosting an event for potential transfer students and we need your help! Opportunities to guide a scavenger hunt team, attend dinner or social event and interact with students are available. This is a chance to share your experiences with other students. Registration is open until October 6, 2017. The Math Department’s Center for Integration of Undergraduate, Graduate, and Postdoctoral Research (I-Center), the Kansas Louis Stokes Alliance for Minority Participation (KS-LSAMP) and the Institute of Computational Comparative Medicine (ICCM) are very pleased to announce a seminar by Dr. Majid Jaberi-Douraki. 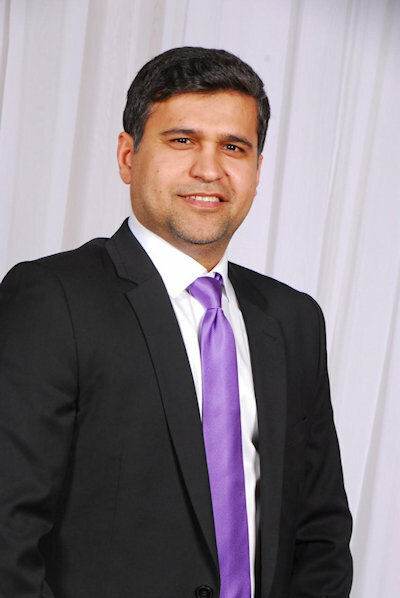 Dr. Majid Jaberi-Douraki’s interests lie in developing biological and epidemiological models. He is an expert in dynamical systems, control theory and numerical analysis. More precisely, Professor Jaberi-Douraki studies autoimmune and infectious diseases, mechanisms of relapse-remission, protein folding in endoplasmic reticulum, pathogen-host dynamics, and age-structured modelling, as well as optimal control strategies, and vaccination/treatment/isolation policies. These talks are meant to be accessible to non-specialists in the area, including undergraduate students, and feature developing research in interdisciplinary fields. In particular, we aim to highlight career options for students in STEM, as well as a offer a discussion of how to prepare for work in this area. We hope to have students and faculty from various departments in the audience who may be interested in the subject. Mathematical modeling with multidisciplinary applications describe the interdisciplinary nature of quantitative modeling using numerical and theoretical algorithms. In this talk, we plan to develop and design mathematical modeling techniques and real-world processes with applications in diverse fields of biology. It is worthwhile to point out that the complexity of processes underlying mechanisms of biological systems and the difficulty in examining them experimentally make the use of quantitative approaches and predictive mathematical models very compelling. For this purpose, we will combine a variety of methods from computational perspective to dynamical system modeling using statistical tools such as Bayesian inference and sensitivity analysis to illustrate how these techniques can be employed to study quantitative analysis of biological processes, predict fundamental and long-term behavior of biological systems, and find solutions to challenging problems which remain incompletely understood. What is the All-University Career Fair and why should I attend? If you are asking yourself these questions, then this event is for you! During this event you will learn how to present yourself to employers and make the most of your time at the fair. You will be part of a small group tour and get first-hand experience speaking with recruiters. Freshmen, sophomore, transfer students or first-time attendees are encouraged to attend. Interested in what you can do outside the classroom? Listen to current K-State students talk about how and why they got involved on campus and how they manage their schedules to avoid over-involvement. No registration necessary. Interested in sharing your STEM/K-State experience with others? KS-LSAMP is hosting an event for potential transfer students and we need your help! Opportunities to guide campus tours (no experience needed), attend dinner or social events and interact with students are available. This is your chance to share your experiences with other students. Registration Required, deadline February 5, 2016: http://bit.ly/vol_TSVDSP2016. Fall Semster is here and we are ready! As the weather is starting to cool down and students are starting to settle into the semester, there is no denying that Fall is upon us. KS-LSAMP is ready! 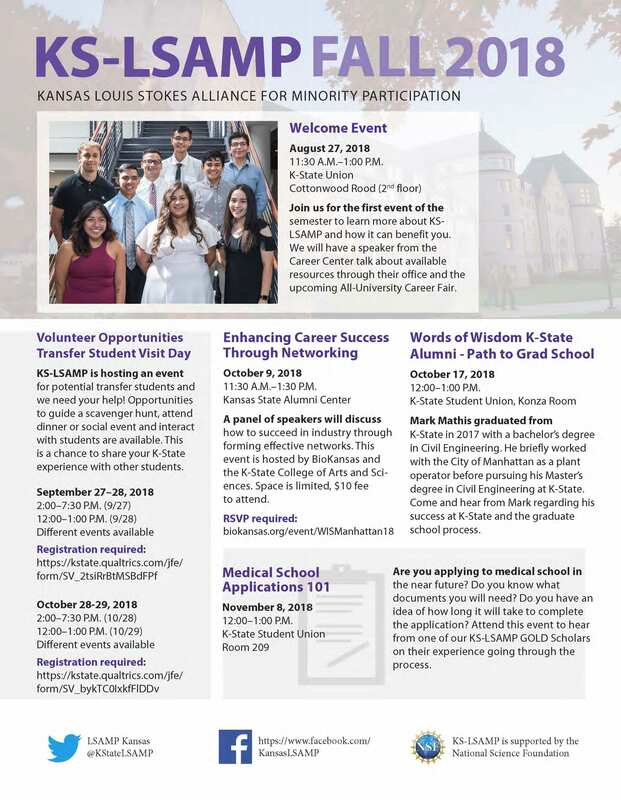 We have several events planned for current K-State students.